Sergei Vasilievich Rachmaninoff, also commonly spelled in English as Rachmaninov, (1 April 1873 – 28 March 1943) was a Russian composer, pianist, and conductor. He was one of the finest pianists of his day and, as a composer, perhaps the last great representative of Romanticism in classical music. Early influences of Tchaikovsky, Rimsky-Korsakov, and other Russian composers gave way to a thoroughly personal idiom that included a pronounced lyricism, expressive breadth, structural ingenuity, and a tonal palette of rich, distinctive orchestral colors. The piano features prominently in Rachmaninoff's compositional output. He made it a point to use his own skills as a performer to explore fully the expressive possibilities of the instrument. Even in his earliest works, he revealed a sure grasp of idiomatic piano writing and a striking gift for melody. 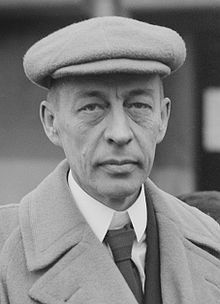 Rachmaninoff wrote two major a cappella choral works—the Liturgy of St. John Chrysostom and the All-Night Vigil (also known as the Vespers). Other choral works include a choral symphony, The Bells, the Spring Cantata, the Three Russian Songs and an early Concerto for Choir (a cappella). He also completed three operas, Aleko, The Miserly Knight, and Francesca da Rimini. He started another opera in 1907, based on a work by Maurice Maeterlinck, titled Monna Vanna, but did not finish it. It was completed by Igor Buketoff and had its first performance in 1984. Click here to view all items related to Rachmaninov.